THE LATEST TECHNOLOGY IN PLANT MATURITY CONTROL. TRIPLE ACTION TECHNOLOGICAL BREAKTHROUGHHave you ever wondered how to get even more quality and aroma from your plants than you currently do – After you’ve grown your plants for so many weeks and got them successfully to the harvest stage, you certainly want to reap only the best quality for your efforts. Until the introduction of Rhino Drive, there has been no guaranteed way to do this. Up until now, getting superb quality has been something of a hit and miss affair. There are many additives that claim improved quality, and no doubt you have tried some or all of them, but the actual results produced will be variable for most growers. Well, no longer. You can now have it all. Heavy yields and superb quality that will blow your socks off are now within easy reach of any grower. When you use triple action Rhino Drive you are guaranteeing yourself the highest quality and heavy yields EVERY TIME. Rhino Drive is a breakthrough in that it uses anti-senescing agents (anti-ageing agents) that interrupt the normal hormonal signals, which tell the plant that it is nearing the end of its life. Normally, plant triggers a hormonal signal to end resin production well before the flowers are mature. The plant’s reaction to anti-ageing agents is to continue to produce resins long after it normally would have stopped; the result is a lot more resin. Maturing of flower buds still takes place, as it should, it just happens a little faster so you can still harvest at the same time you normally would. Up until now, this anti-senescence technology has been the secret of the cut flower industry. The same technique of producing larger flowers with more perfume is being offered to you for the first time. In addition to the blockers, Rhino Drive also has two more modes of action. The first is anti-ageing and second is the root enhancement. 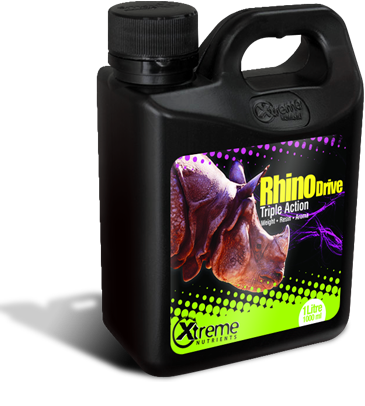 The specialized organic faction of Rhino Drive ensures that cell permeability of the roots is enhanced and maintained at an optimal level. This not only ensures that the anti- senescence hormonal blockers are quickly absorbed by the plant but also that the plant is easily able to absorb the highly specific nutrients to support the increased resin production. The third activity of Rhino Drive is to pack on weight. The inclusion of chelated potassium and silicate compounds and two unique plant amino acids adds weight and strength to the flowers and stems. The two amino acids are found in tuberous plants (food storing plants). The presence of these two particular amino acids tricks the plant into thinking it needs to store energy, it does this by utilizing the chelated potassium silicate compounds to create the structural support to hold the extra energy. The result is heavier flowers. When you use Rhino Drive, you are using the very latest technology in the area of plant maturity control. Use from 3rd week of the Bloom cycle until the 2nd last week before harvest at the rate of 10 ml/gallon and 20 ml/gallon in the last two weeks of flowering. This will increase PPM by approximately 200.